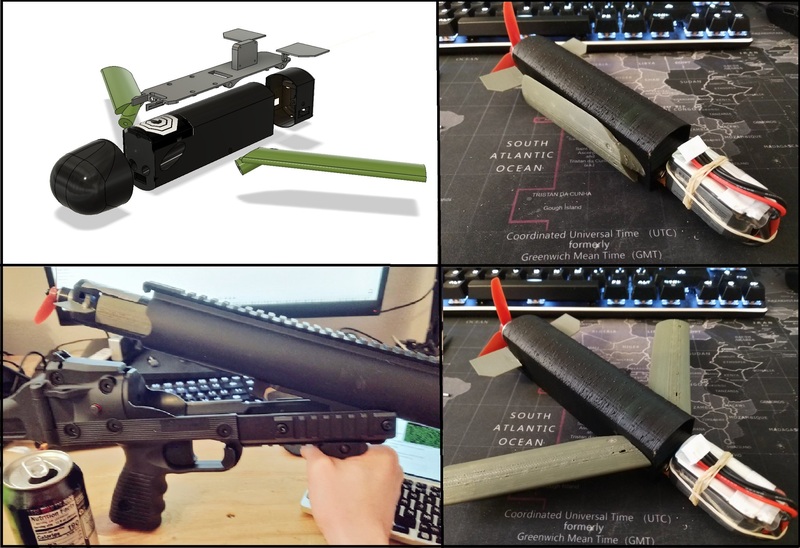 Ever wanted to deploy a drone from a grenade launcher? A lot of drones were harmed in the making of this talk. This talk will demonstrate a process for designing and 3D printing your own canister launched drones. Canister launched drones are compact and portable, however conventional designs lack sufficient wing area and deployment mechanisms, making payload capacity and flight times far lower than they could be. I’ve created a concept that makes use of low weight, high tensile fabric wings which allows small drones, such as the 40mm diameter unit depicted below, to have practical on-site flight times while carrying a useful payload. 3D printing technologies allow the majority of the parts for these drones to be produced by anyone, making them easily accessible. The materials cost is about a hundred dollars per drone, and payloads for WiFi wardriving and Software Defined Radios are getting more capable. Future plans for this project include networking a bunch of these drones together to maximize their capabilities, forming distributed mesh-networks to coordinate mapping and modeling of large areas in a short time. These low cost, rapidly deployable drones would then result in distributed reconnaissance of a target area at significant speed.